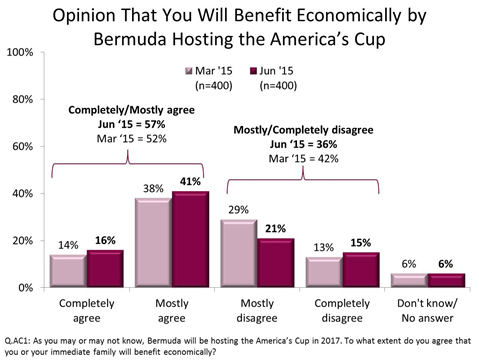 According to a recent survey conducted by Total Research Associates Ltd, 57% of Bermuda residents believe they, or their family, will benefit economically from having Bermuda host the 35th America’s Cup in 2017. In releasing the poll results, the company said: “Residents of Bermuda increasingly believe they, or their family, will benefit economically from having Bermuda host the 35th America’s Cup in 2017 [57% in June, versus 52% in March 2015], according to the most recent survey conducted by Total Research Associates Ltd.
“Residents were asked to what extent they agree that they or their immediate family will benefit economically from Bermuda hosting the America’s Cup in two years’ time. The question was also asked three months previously. Results show a shift towards agreement in that time period, as illustrated in the graphic below. “With research, the design of the question that is asked is of paramount importance as is the methodology for gathering the data. We are asking a neutral question which allows the responder to consider their position before providing a response,” said Steven Spencer-Arscott, COO of Total Research Associates. “It is good to note that the majority of residents see evidence that they will personally benefit from this event being hosted in Bermuda, and agreement has grown across all segments of the population in the last three months. That includes people with all levels of income and race,” said Mike Winfield, CEO of ACBDA. While a third of the population doesn’t yet feel they will benefit, the main reason is that so far they are unable to see how they will. We are in the early stages of a two-and-a-half year process and already we’ve seen as many as 50 local contracts awarded for a range of services, in addition to homes being rented, vehicles purchased and jobs created. The company added, “Results were garnered from the latest Bermuda Omnibus Survey© an independent, syndicated quarterly survey of Bermuda residents. It is the elephant in the room, but what about a breakdown by race? why does race have to enter EVERY time. Why can’t we ALL just be BERMUDIANS??????˘? Bermudians or “real Bermudians? Please be more specific. Ya get it? You are so wise you tell me who is a “REAL BERMUDIAN”?? I bet I could guess. This figure will only improve as we get closer to the event. I will be interested in seeing the results of same poll after October event. Your turn I was waiting for the other shoe to drop once the other poll showed such a negative response in regard to the same question. Once again proving Bermuda polls are useless. the one Chris Famoussssss was pushing that was worded such that it steered takers to a negative opinion? The one that was pushed hard by a guy with an agenda, so people who were more likely to have negative opinions to begin with? Everyone will benefit. Some, who actually put some effort in and don’t just sit back and wait for benefits, will benefit more. Anyone who cannot see that any activity incouraged to our shores will bring us some revenue. We do not make anything,not even enough babies anymore,we do not produce anything. Everything that we eat is imported,everything that we wear is impirted,everything that we use is imported. TELL ME WHAT DO WE PRODUCE IN BERMUDA……………..nothing. 85% of our income is produced by the IB Companies. 15% of our income is produced by the tourists. This sailing thing will bring revenue to our COUNTRY just tye same as example NewPort/Bermuda race.